Vancouver, British Columbia--(Newsfile Corp. - April 4, 2019) - Fremont Gold Ltd. (TSXV: FRE) (FSE: FR2) (OTC Pink: USTDF) ("Fremont" or the "Company") is pleased to announce its plans to drill the Gold Canyon project this spring and the North Carlin project this summer. Drilling at Gold Canyon, adjacent to McEwen Mining Inc.'s ("McEwen") Gold Bar project, will target several geochemical anomalies recently identified by Fremont (see news release dated December 18, 2018). 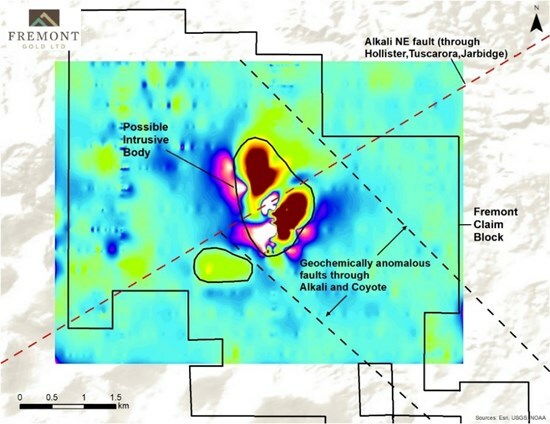 Drilling at North Carlin, located at the northern end of the Carlin Trend, will target a coincident gold and mercury soil anomaly situated on the flank of a magnetic high (see news release dated October 11, 2018). Fremont's Gold Canyon is a former gold mine in the Gold Bar district in Eureka County, Nevada, an active mining area within the Battle Mountain-Eureka Trend. 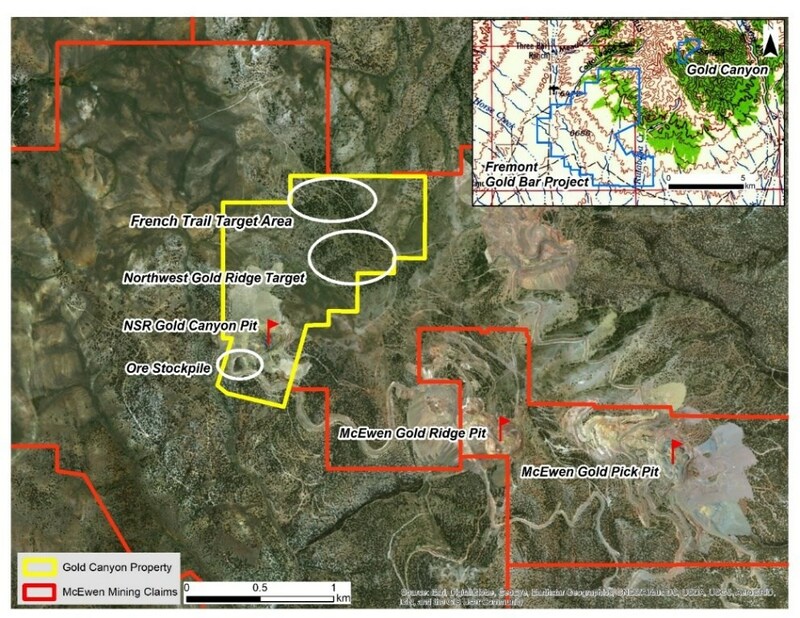 Gold Canyon produced approximately 41,000 ounces gold from 1990-19941 and is less than ~1-km northwest of McEwen's Gold Ridge Pit, one of four deposits that comprise McEwen's Gold Bar project (see Figure 1). Rock chip samples taken by past operators defined the Northwest Gold Ridge and South French Trail targets. Based on the previous work, Fremont conducted a soil sampling program and identified three significant soil anomalies which the Company plans to drill test in May (see Figure 2). The anomalies occur in areas underlain by lower plate Upper Denay Limestone carbonate rocks and the Roberts Mountain thrust, both known to host gold deposits in the district. Geochemical sampling has defined coincident gold, arsenic, antimony, silver, mercury and thallium soil anomalies bordered by barium and copper anomalies. The largest anomaly, approximately 400 metres x 350 metres in size, is located southwest of the Northwest Gold Ridge target (see Figure 2). The anomaly patterns suggest the intersection of a NNW-SSE structure with the important NE-SW fault, which is known to have controlled gold mineralization at the Gold Canyon mine (see Figure 2). 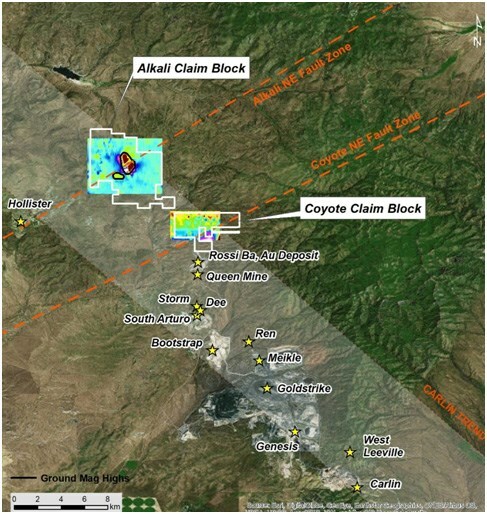 The North Carlin project is located at the northern end of the Carlin Trend, Nevada, and is comprised of three claim blocks, Alkali, Coyote, and Rossi. North Carlin is more than 42 square kilometres in size and the Rossi claim adjoins the Rossi mine, recognized as the most northerly deposit along the Carlin Trend (see Figure 3). Since staking Alkali and Coyote in 2017, Fremont has conducted soil sampling and mag surveys at both claim blocks and has outlined a number of drill targets. A recently completed soil sampling program at Alkali identified coincident gold and mercury geochemical anomalies associated with a conspicuous magnetic anomaly which the Company plans to drill test (see Figures 4 and 5). 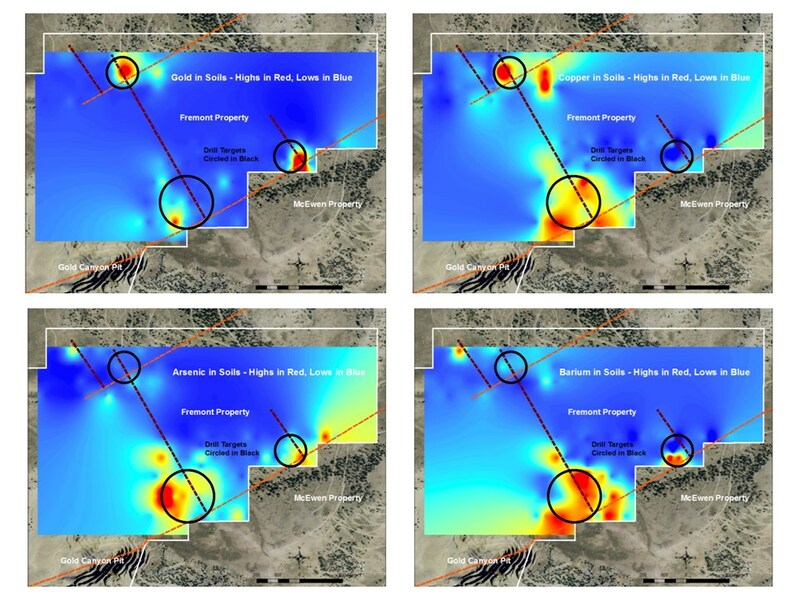 Together, the data suggests the presence of gold mineralization beneath alluvial cover and represents an exciting drill target within Nevada's most prolific gold belt. 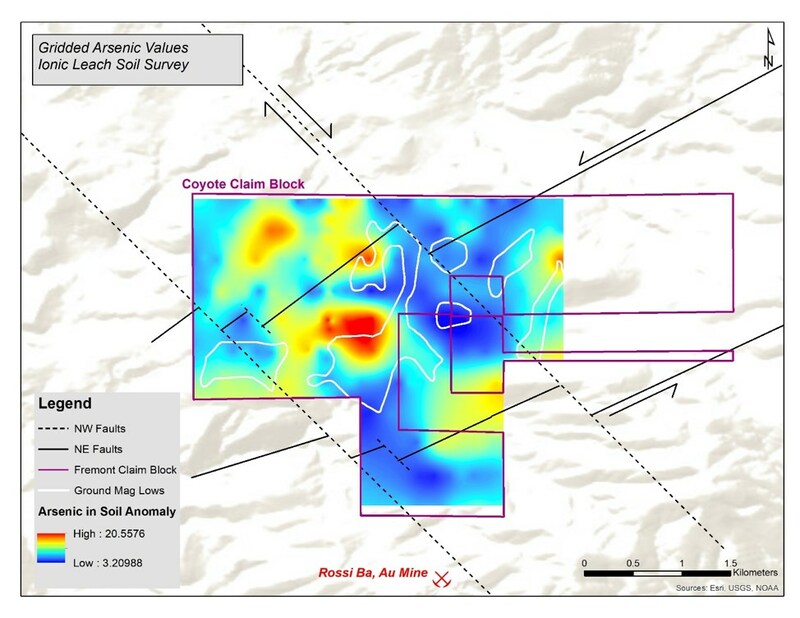 At Coyote, Fremont has identified a large arsenic anomaly coincident with mag lows in the centre of the claim block (see Figure 6). 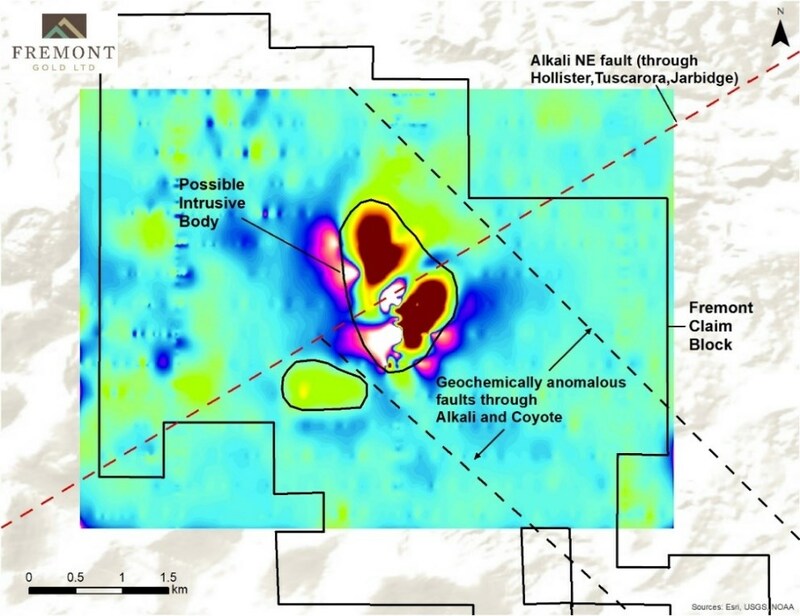 Based on the exploration work that the Company has completed, and the periodicity of deposit locations along the northern part of the Carlin trend, Fremont believes that Coyote is an attractive setting for the discovery of a Carlin deposit. Alkali is located at the intersection of the northern extension of the Carlin Trend and on a northeast-trending lineament, which hosts the nearby Hollister and Tuscarora mines, and farther along strike, the Jarbidge and Goldbanks mines. These current and historic epithermal deposits occur in a permissive structural corridor, which includes the Alkali NE fault (Figures 3, 4, and 5) that cuts directly through the magnetic high and soil geochemical anomaly at Alkali. Carlin deposits to the south of Coyote display a regular spacing of approximately 3 kilometres between deposits, which would make Coyote the "next bead on the string" in terms of periodicity and alignment (see Figure 3). This observed periodicity, along with pathfinder element geochemical anomalies associated with subtle magnetic lows, makes Coyote an attractive exploration target. Fremont completed three reverse circulation drill holes at the Gold Bar project, located in the Gold Bar District, Eureka County, Nevada (see News Release dated February 6). One drill hole was designed to test a geochemical anomaly to the southeast of the historic Gold Bar mine, which may have represented a possible extension to the historic mine. The hole was terminated at 305 metres without intersecting bedrock. The other two holes, drilled on the southwest side of the Gold Bar pit, were designed to test for a possible feeder system at depth. Fremont targeted two mineralized faults, that had been mined higher in the section, that were thought to be dipping towards each other to test for a possible feeder system. The first hole intersected large void spaces along the first fault at 100 metres and was terminated. The second hole, offset 10 metres from the first hole and drilled at a steeper angle, successfully drilled through the first fault and intersected the second fault at 150 metres, about 60 metres below the level of the pit floor, but again encountered open fractures, resulting in lost circulation and little to no sampling. The hole was terminated at 190 metres. Samples returned around the missing intervals had weak gold mineralization, slightly above 100 ppb gold. 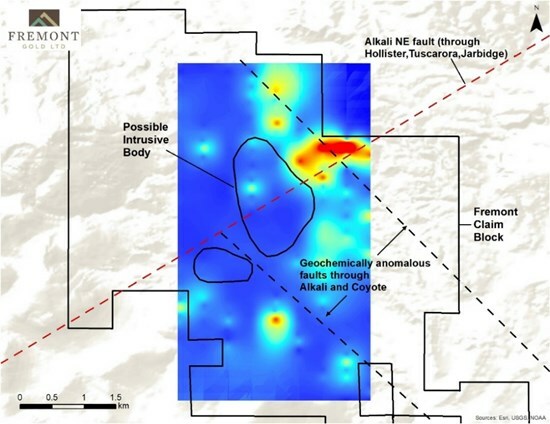 The two holes drilled at the southwest side of the Gold Bar pit confirmed the existence and geometry of the faults at depth but did not return strong enough values to warrant further drilling. The Gold Bar project contains the Gold Bar mine, which produced 286,354 ounces of gold from 1986 to 1994 (1), and the Millsite deposit, which hosts a historic resource of 147,000 ounces of gold (1.62 Mt @ 2.57 g/t gold) (1,2). Fremont's mine-finding management team has assembled a portfolio of high-quality gold projects in Nevada with the goal of making a new discovery. 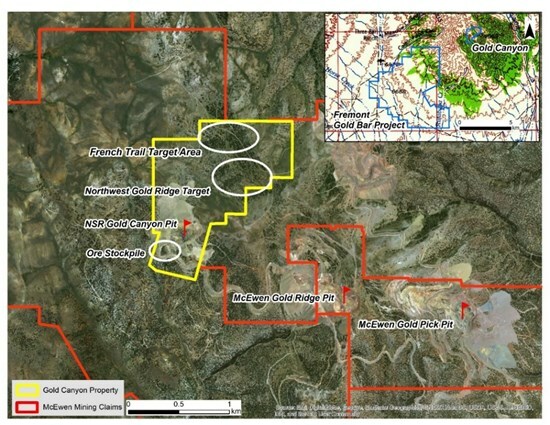 Fremont's Gold Bar and Gold Canyon are past producing gold mines adjacent to McEwen Mining's Gold Bar project, where mine construction is underway. Other projects include Goldrun, Hurricane, North Carlin, and Roberts Creek. We are aligned with our shareholders: Insiders own ~20% of Fremont. 1 Internal report, Atlas Precious Metals, Mines, December 13, 1995, prepared by Pincock, Allen & Holt. 2 The Company has not verified these historical resources and is not treating these historical estimates as current mineral resources. Certain statements and information contained in this press release constitute "forward-looking statements" within the meaning of applicable U.S. securities laws and "forward-looking information" within the meaning of applicable Canadian securities laws, which are referred to collectively as "forward-looking statements". The United States Private Securities Litigation Reform Act of 1995 provides a "safe harbor" for certain forward-looking statements. Forward-looking statements are statements and information regarding possible events, conditions or results of operations that are based upon assumptions about future economic conditions and courses of action. All statements and information other than statements of historical fact may be forward-looking statements. In some cases, forward-looking statements can be identified by the use of words such as "seek", "expect", "anticipate", "budget", "plan", "estimate", "continue", "forecast", "intend", "believe", "predict", "potential", "target", "may", "could", "would", "might", "will" and similar words or phrases (including negative variations) suggesting future outcomes or statements regarding an outlook. Forward-looking statements in this and other press releases include but are not limited to statements and information regarding: The planned drill program at Gold Canyon in the spring and North Carlin in the summer. Such forward-looking statements are based on a number of material factors and assumptions and involve known and unknown risks, uncertainties and other factors which may cause actual results, performance or achievements, or industry results, to differ materially from those anticipated in such forward-looking information. You are cautioned not to place undue reliance on forward-looking statements contained in this press release. Actual results and future events could differ materially from those anticipated in such statements. Fremont undertakes no obligation to update or revise any forward-looking statements included in this press release if these beliefs, estimates and opinions or other circumstances should change, except as otherwise required by applicable law.